DRAFT ANALYSIS: "A lightning small forward with maniac defensive pressure and great goal sense." The live-wire Gippsland small forward and developing midfielder is one of the most exciting players on offer, with Hawthorn having first rights through the Next Generation Academy program. Affectionately known as “Mozzie”, he possesses all the attributes that AFL clubs are looking for in a modern goal sneak inside 50. Having moved to Gippsland from the remote Western Australian town of Halls Creek, Mosquito has been on the AFL radar for a few years now. He has been a regular in the Gippsland line-up for two seasons, where he consistently excites with his speed, flair, evasiveness, defensive pressure and match winning nous. Mosquito was set to play a major role for Vic Country at the National Championships with many looking forward to seeing what he could offer at the higher level, before injury ruined those plans. He was able to return to the Power fold shortly after the Champs to again give recruiters plenty to think about. 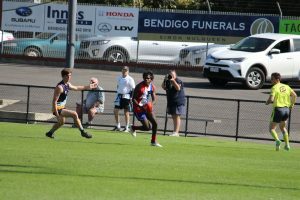 While his TAC Cup finals series was not as electric as hoped, he has shown more than enough to suggest that he has much to offer at the top level. Mosquito is a player that passes the eye test every time you see him on the field, whether it be a fast one touch pick up, a blind turn out of trouble or an incredible chase down that can inspire his teammates into action. He is that type that makes things happen and he will get other players involved in doing so. Inside 50 he is capable of producing that single moment at a clutch time, from a fast hit crumb and snap off his lethal left boot or creating space from nowhere to start a scoring chain. There is goal sense and X-factor here that you can’t teach. The number one attribute that you always find yourself describing about Mosquito is his manic defensive efforts without the footy. He creates genuine anxiety for the opposition inside Gippsland’s forward arc and has produced some of the longest successful chase down tackles I’ve witnessed at TAC Cup level. You can already imagine it occurring at AFL level and the crowd buzzing as he goes off on one of these quests at speed. He also has enormous scope, especially through the midfield where he developed dramatically in 2018. While his outside traits and carry are obvious for all to see, his inside work at the centre bounces and around the ground stoppages became more relevant as the year went on. His clean touches and sharp hands can release space quickly and when he breaks from congestion, there are few other players you want with the ball moving forward with his excellent use. While you come away from games writing many notes on Mosquito due to all the AFL attributes he presents, you also often drive home craving more. He can certainly improve on being involved for longer periods of the game, especially offensively. There is no doubt he possesses the weapons, but we did not see him win any more than 19 disposals in a game and was often left in that 10-15 possession range. They are good numbers if playing permanent forward, but need to lift considering the amount of times he rotated through the midfield. Thankfully he does not need the footy too many times to have a huge impact. An obvious natural improvement to winning more of the ball is increasing his endurance and getting to more contests. There were times throughout the season where he had the ball on a string through the midfield, but was only capable of short stints and was quickly found back forward or resting on the bench. He is a player you want in the action for as long as possible, while it will also further progress his defensive pressure with greater repeat efforts and help be rewarded offensively on a more regular basis. With the opportunity to get to a greater total of dangerous ground balls inside 50, I’m sure he can rise from a goal a game footballer to average two or more. Irving Mosquito is your classic small forward who provides the tricks, goal sense and most importantly the manic defensive pressure that all AFL coaches preach in the modern game. He is still extremely raw and has key improvements to get the most out of himself, but just ticks so many boxes for what clubs are after, including his traits through the midfield. The Hawks are probably going to have to pay more than they had originally hoped, but with the premature retirement of Cyril Rioli, the addition of “Mozzie” will certainly ease that disappointment.